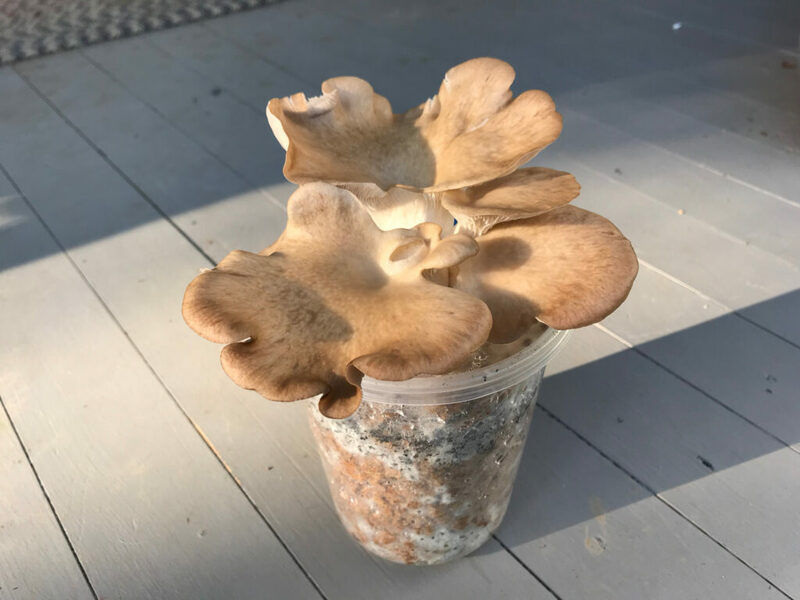 For a long time I have tried different ways of growing mushrooms in containers that do not result in a lot of plastic or other kinds of waste when you finish with them. That means you have to be able to reuse, recycle, or compost the container. Non-sterile growing methods, where you do not sterilize your growing media or, more important, you do not have to sterilize your media right in the growing container would work with a much wider range of container materials because the containers don’t have to withstand the intense heat of pressure sterilization. If you know how, you can grow mushrooms in almost any kind of container that retains water. So why not work out an approach that will work well for home growers and might also work for a commercial product produced in volume? You might think someone has solved this problem for commercial mushroom production already – for example, by using recyclable glass or polypropylene jars – but most growers choose not to use them. This happens for various, sometimes complicated, reasons, which for some of us makes this an interesting problem to explore. It is also important. Our rivers, lakes, and oceans are full of plastic particles that get into the food chain, kill aquatic animals, and contaminate those that feed on them – including us. I invite you to work with me to develop a zero-waste mushroom ‘pot’ for efficiently and reliably growing mushrooms. Initially we will focus on growing oyster mushrooms in deli cups. Oyster mushrooms are easy to grow and deli cups are cheap and easy to work with. I have been experimenting with this approach for a couple of years now, with oysters and other species. The idea isn’t new, and lots of hobbyist-growers have done it. I have worked out enough of the process that starting in a few weeks I will start selling grain spawn, colonized bulk substrate, and a Grow-it-Yourself kit exclusively in these containers. Even so, a few problems and decisions remain that I could use help with. Rather than keep the research and development process secret until launching a new product, I want to open it up to public participation in hopes of getting solutions faster and to share a process everyone can learn from along the way. All the information developed will be freely available for anyone to use. You won’t have to buy anything to participate. You can just follow the posts that appear here and, if you want to, join in the discussion via the comments. I will make materials that we want to test available for sale, and offer discounts to people who report their results. In the next post I will go into more detail about the materials and methods involved in the zero-waste deli cup fungiculture adventure. I hope you will tag along! Kudos to you! I Joyously look forward to your journey. I only grow mushrooms that do not grow in poop – LOL, but it is always nice to see someone reaching upward to a more kind way of life. Why not use the plant pots made out of compostable materials. The ones that look like paper machete or shaped cardboard. After your done growing the mushrooms, you can toss the containers on a compost pile or toss it in the trash to be recycled. It’s a great idea that would make an ideal solution, in theory. I have tried things along those lines, and while it can work nicely, it does have complications. For instance, you need to ensure that the container does not introduce (too many) contaminants itself. Also, moisture seeps out, and tiny critters can get in, so you need to provide an enclosed environment during colonization and perhaps beyond. Have you tried it? It’s the kind of thing I want to discuss in more detail through this series. Thinking this over, I have a question. As a hydroponic farmer, I continually re-use the food grade buckets. I wash them with Bronner’s liquid soap, then wipe them out with a Lysol disinfecting wipe, rinse the bucket and let it sit in the summer sun for a couple of days, sometimes with a piece of plastic over the opening of the bucket if the bucket is older and may have become contaminated. As everyone already knows, diseases can get into the water in the bucket, as well as algae deposits so what is it about growing mushrooms that requires such extreme sterilization methods as pressure sterilization? I have worked on the premise for many decades that one of the biggest problems is technology. The more you baby something, the weaker the constitution of the organism becomes. Over time the DNA of the plant, or whatever it is being grown causes something akin to an immune disorder. This is what is happening with hybrid plants and trees. Which is why a lot of farmers including myself are working within landrace methods. Plus…..weakness and corresponding illness can be traced back to the supplies being used. As an example, poop. What did that animal eat to make the poop? Was it fed GMO feed? What kind of quality was the water it drank? Was it being given antibiotics? In days past, this was not an issue, so in 1970 mushrooms were going to be healthier and not succumb to illness and disease because the poop was not toxic. Perhaps instead of focusing on the container, you might want to take into account what is that base cause of disease that would necessitate sterilization. In my line of work everyone gets in a tizzy because of algae and they go to great lengths to eradicate it, causing more harm than good. I live in the desert of California, algae is a constant within hydroponics. But you know what? I started letting the algae do its thing and it has not been a problem. I used to clean and disinfect everything like a zealot, changing out water every 7 days. Now I don’t. And everything is fine. The DNA of the plants and trees adapted over a few seasons and all was well. You raise several interesting subjects, some of which I want to go into in detail in the next post I’m working on. For now, let me briefly address the basic question(s) of what is different about growing mushrooms that requires so much emphasis on sanitation without going into detail about the ramifications. When comparing mushroom and plant cultivation we mostly have to consider the differences between their physical structures. You might call this their body architecture. Most higher plants have different body parts for specialized functions. Leaves perform photosynthesis, roots absorb nutrients from the environment and anchor the body, the vascular system transports nutrients around the body, and an epidermis (like bark) forms a barrier between the inside and outside. Flowers (or corresponding organs, like conifer cones) carry out sexual reproduction. The higher fungi don’t have the same degree of organization. While there are lots of exceptions, in general their body consists of a mass of simple fibers (mycelium). The mycelium grows in a substrate, like soil or a plant body, digesting it as it goes. It produces chemicals to digest its substrate and fight off its enemies. Every now and then they cooperate to create a fruiting body – a mushroom – to carry out sexual reproduction by producing spores. Growing mycelium resembles growing cultures of primitive organisms like the bacterial cultures in yogurt, or fungal cultures like the yeast in bread dough, more than it resembles growing plants. For another analogy, consider how you would cultivate the algae that you now consider a pest in your hydroponic growing. Rather than trying to exterminate it, you would try to suppress or eliminate the competing organisms that would just love to contaminate the nice, rich solution your algae grows in. That would require a number of different approaches, certainly including conscientious sanitation. For centuries people have devised methods of growing mushrooms that did not involve technologies like pressure sterilization. I have been working with a particular set of non-sterile methods that I think hold promise for further improving what we already know how to do. 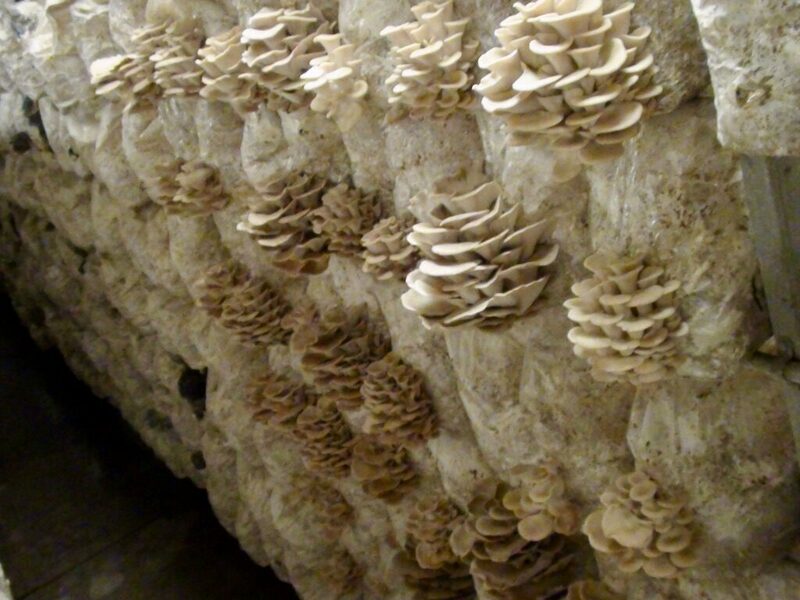 A complete set of methods will need to address things you mention like the qualities of cultivated mushroom strains and how they can change over time, where substrate materials come from and how they get processed, containers and how they get handled, growing environments, and more. We’ll see if the focus on the container provides a useful way to talk about many of these things. By the way, I had not encountered the term landrace before your note: a local cultivar or animal breed that has been improved by traditional agricultural methods. Interesting to consider what that could mean in the fungicultural context! Ah yes, I get it. I make my own yogurt and if the container is not sterilized, the end result will not be yogurt. But they did not do this in the olden days so as you said, we are on a journey to reclaim ancient knowledge, but more importantly, Wisdom. I have taken soy milk and just left it in a jar for a couple of days and it congeals…..and tastes sweet. Landrace. This concept started being revisited about 20 years ago with the primary mover and shaker being Joseph Lofthouse (http://garden.lofthouse.com). He realized that even heirlooms, the way we are growing them, are really hybrids because they are not crossing with others of the same nature. The result has been that the heirlooms are no longer any healthier than hybrids, AND they are now hybrids because the DNA structure is being kept stagnant and not allowing Nature to Expand. He started by planting I believe it was 200 types of watermelon in the same field. And so it has gone, with many of us joining in the chorus. And of course, the main focus is also that you are creating with nature, not dominating it….and creating a strain that is indigenous to your specific geographical location. He still sells his seeds for a dime. I really look forward to sharing in your journey. I tried growing mushrooms here in the desert and it succeeded but yield was low. I would like at some point to pursue growing Lion’s Mane. Everything is adaptable, we just have to listen until we hear. Congrats on the new site, looking forward to this discussion and information! I have two questions on this – are the Deli cups going to be the compostable corn plastic, or a different plastic (such as PP) ? I’m just asking because I’m in the process of learning more about plastics due to 3D printing.. Some time I want to experiment with a small scale ‘industrial’ composter system that could compost the corn plastics at home (if possible). My other question is about the growing medium… We have a lot of leaves and things here (hickory, maple and other leaves).. And I’m actually starting to make my own mulch using a wood chipper. I wonder if would it be possible to sanitize (using the peroxide method) and use some of these materials in place of the pre-made wood pellets? Excited to follow along with these experiments! I’m very interested in using PLA (corn plastic) and/or other plant-derived materials. A friend mentioned that people use PLA for 3D printing, which seems very cool! I read that PLA will decompose in a home compost heap, just not very quickly – maybe in 18 months or so. That’s still better than any petrochemical-based plastic. Please let us know if you learn more! The container material is one of the decisions to make. More on that later. Leaves tend to be problematic for substrates (growing media) in containers because they tend to carry a lot of contaminants. 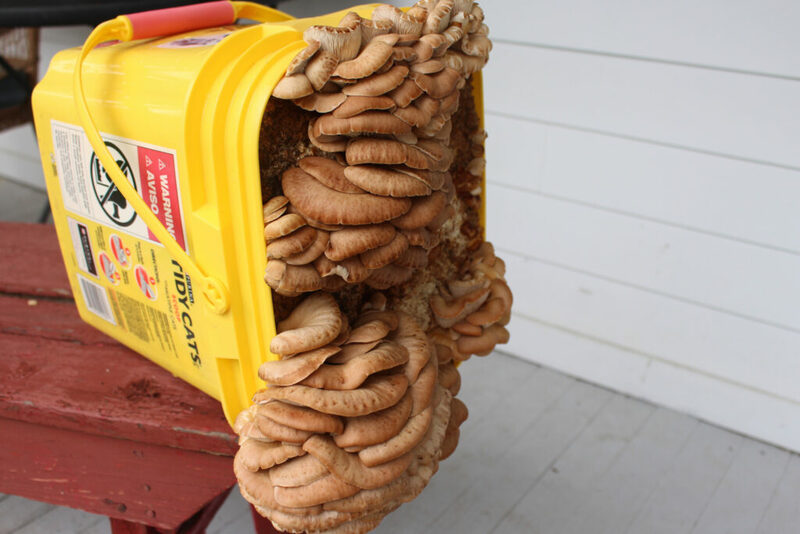 Tradd Cotter writes about using yard and farm waste materials for container culture in his book Organic Mushroom Farming and Mycoremediation. He recommends pasteurization, a low-heat method you can do in several different ways. I wouldn’t use peroxide to sanitize yard waste. It would probably take quite a lot of it to do the job. When I refer to the peroxide method I usually mean Rush Wayne’s technique of using it peroxide to suppress contaminant spore germination (see mycomasters.com). For that to work you have to heat-treat your materials to break down peroxide-decomposing enzymes (and pasteurize it in the process). This doesn’t require pressure sterilization, you can do it in an oven or backyard equivalent. Wood chips work well this way. For oyster species, and apparently shiitake too, you can also use hydrated lime to condition the substrate. That’s one of the things I want to work through, figuring out exactly what it takes to use wood chips and/or loose sawdust. Thanks for the info – I’ll have to read up more on all of these ideas! If I find anything interesting I’ll be sure to share. I haven’t tried composting any of my wood PLA 3D prints yet, but I’ll have to set something up to test that and see if it really does break down naturally.